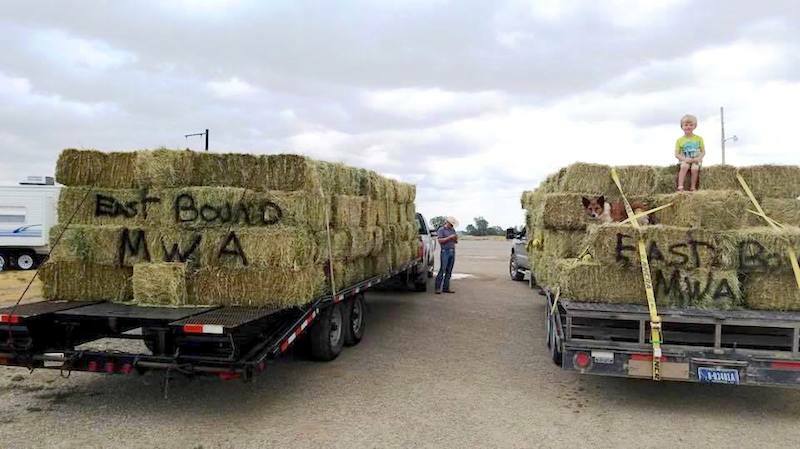 Two trailers head east from Great Falls to Winnett carrying hay donated by Mike and Connie Brumble. The individuals involved in loading, transporting, and unloading are Tate Switzer, Chet Wright, Zoey Wright, and Cody Bourdeau. There’s a reason agriculturists are known for being hard workers. They have to be. There’s no hitting snooze during calving season. There’s no such thing as a forty hour week at harvest. If you want your farm or ranch to succeed, you have to be willing to put in long hours, push your body to its limit, and stay informed on the latest trends of the industry. Why? Because agriculture is a gamble. Bad luck comes in the form of poor market prices, catastrophic weather, and other challenges that are out of agriculturists’ control. Ultimately, farmers and ranchers play the hands their dealt as best they can. It’s a harsh reality for Montana’s number one industry, and it’s why natural disasters like the Lodgepole Complex fire can be so devastating. Burning more than 270,000 acres in northeastern Montana, the Lodgepole Complex fire overwhelmed many in Garfield County. Several homes were destroyed and some ranchers lost close to 100 percent of their range land. To make matters worse, the county was already experiencing a horrible drought, so few have excess grass to spare. “These unexpected costs, compounded by the fact that cattle prices are down . . . it’s going to be a challenge for some of these operations to move forward,” says Rex Phipps, a Garfield County rancher and CEO of Garfield County Bank. “Growing up here in the community, I know most of the people very well that were affected,” he says. His friends and neighbors were among those who lost hundreds of thousands in cattle, hay, fencing, and other property. These losses won’t just be felt in 2017 but in years to come as well. The stress has caused some cows to abort their pregnancies and the weaning weights of calves this season will likely be lower. The fire will have long term effects on herds in the region. “If these ranches don’t get the support to stay viable, it will be devastating to our county,” says Phipps, who – like many – is working to help those affected. In fact, Garfield County Bank has partnered with a local non-profit that will give 100% of funds to local landowners affected by the Lodgepole Complex fire. In addition to monetary donations, there are individuals and organizations donating fencing, hay, and other resources, not to mention time to help landowners get back up and running as quickly as possible. “A lot of help has come in,” Phipps says gratefully. When the chips are down, Montanans come together. Why? Because agriculture is a gamble… and if we want to keep feeding the world, we have to bet on our farmers and ranchers. To donate to the Garfield County Fire Foundation, mail your check to PO Box 6 Jordan, MT 59337 or donate online at centralmontanafoundation.com. For more information, call Garfield County Bank at (406) 557-2201.